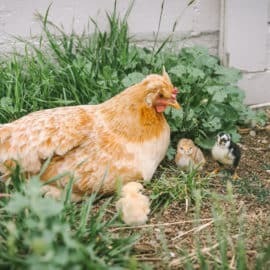 Let’s say you’re a first-time chicken owner, and you’re ready to tackle this backyard chicken gig. You can’t resist the temptation at the feed store, so you find yourself driving home with a box of chirping, fuzzy yellow chicks in your lap. At $3-$4 per chick, that’s a small price to pay for beautiful, home-raised hens that will give you your own eggs for free, right? Here’s the problem… There’s no such thing as a free lunch, and no such thing as a free egg. And any other random chicken accessories that might strike your fancy. Of all the items on the above list, the one we chicken-addicts talk about the most is the feed. Why? Because buying good chicken feed at the store is so expensive it’s almost physically painful. So, homemade chicken feed has to be cheaper, right? Eh, maybe. But don’t count on it. Unfortunately, it’s not super easy to put together, and I could only find ONE mill in my area who would even attempt to help me with it. 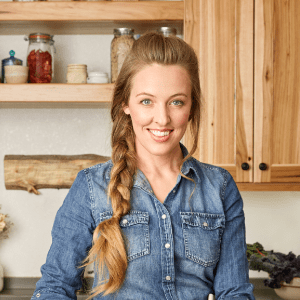 So, when I saw that my favorite permaculture chicken guy, Justin Rhodes, had a favorite non-fussy homemade chicken feed formula he uses and loves, I was all over it. As stated above, this is Justin’s recipe. 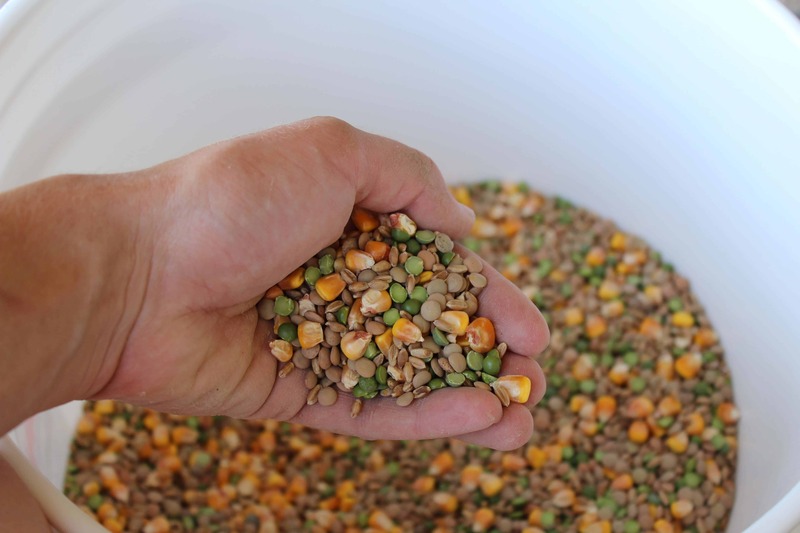 I personally use a custom-mix that my local feed mill helps me to put together. 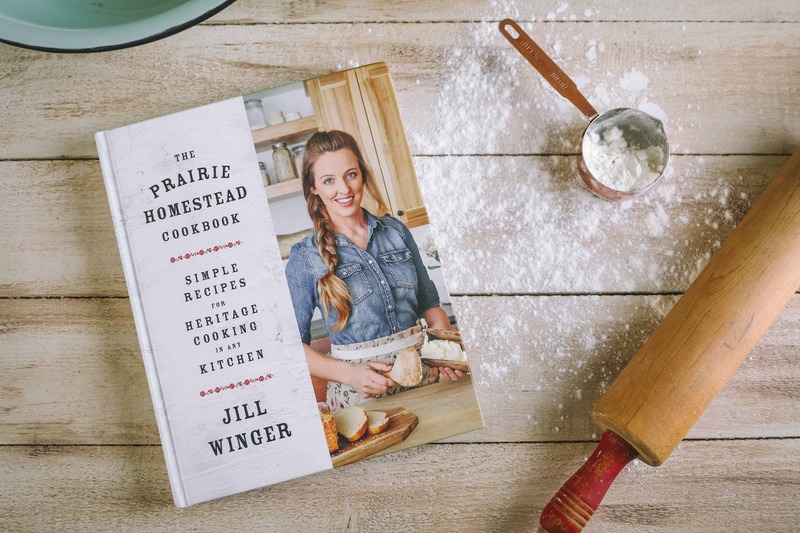 The recipe for that mix is in my Natural Homestead book. However, it is a more complicated formula (with more difficult ingredients), so I wanted to share Justin’s simpler option. You do not have to grind the grains– just feed them whole. There are no lentils in the recipe. The photos in the post (with lentils in them) were shot a while ago, and thought they’d be a good fit for this post. This particular recipe does not contain lentils. Since I have my feed mill custom-mix me a different recipe, I do not have price breakdowns for this particular recipe. 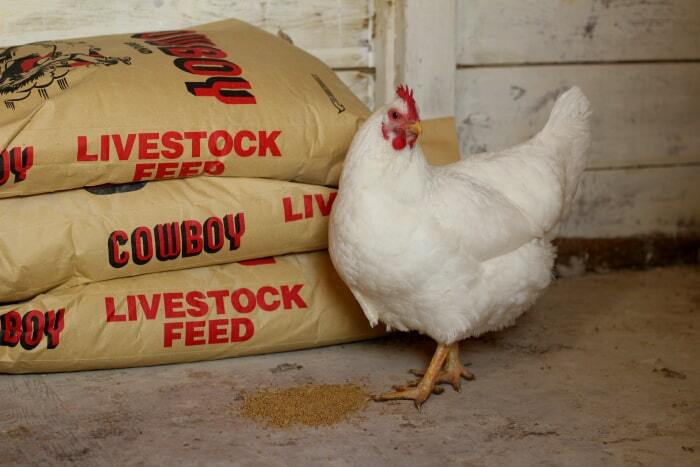 Mix together and feed as you would any other chicken feed. 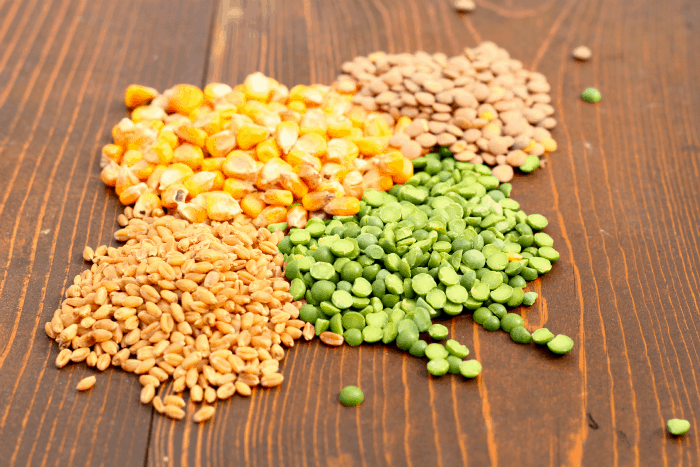 Since you are using whole grains, it should not loose it nutritive content as quickly as more processed feeds. If you want this to be organic/non-GMO, you’ll need to source organic/non-GMO corn, etc. That may or may not be possible in your area. If you want to purchase kelp in larger quantities, I often get the 50 lb bags of Thorvin Kelp from Azure Standard. I also feed kelp to my cows, goats, and horses. The Poultry Nutri-Balancer is a vitamin/mineral supplement designed to keep your flock in tip-top shape. Even if it’s slightly more complicated for you to source, I wouldn’t skip it. Here’s a dealer locater to see if you can find it in your local area. Aragonite is a source of calcium, which is vitally important, especially for layers. Another calcium option is crushed egg shells. I like how flexible this formula is– you can make a small amount or a large amount. No doubt, I will get some emails over this post. There are websites/books/etc that turn feeding chickens into rocket sicence, and admittedly, you DO need to be careful in how you are balancing rations. However, I always go back to the fact that great-Grandma was keeping her flock productive long before there were shiny bags of “Chicken Chow” at the feed store, so I hesitate to overcomplicate the matter. Plus, when someone with WAY more chicken experience like Justin has consistent success with a recipe like this, I trust that. Over the years, I have received emails from people in an absolute panic over what to feed their chickens. GMO/non-GMO, organic/non-organic, homemade/purchased—there is, indeed, a lot of options out there. But here’s the deal—we can’t control every aspect of our lives. Even if you (or your chickens) are eating the most perfect diet in existence, you/they will still likely be exposed to toxins in the air, soil, water, etc. This is just a side-effect of living on an imperfect planet. Therefore, my conclusion is I will do the best I can, and even if I can’t source the perfect ingredient, I will be at peace knowing I did the best I could and they are still eating 100% better than industrially-farmed chickens. Seriously guys—please don’t lose sleep over chicken feed. Cut Your Chicken Feed Costs Even More! 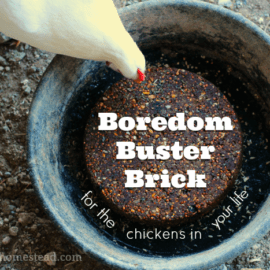 Not only did my friend Justin generously allow me to publish his feed recipe, but he’s teaching a special LIVE webinar this Sunday, (June 26th, 2016 at 3pm EST) and sharing 20 of his best stunts for reducing chicken-feed costs! Like I mentioned before, I always appreciate Justin’s information– it’s meaty, specific, and actionable. Without fail, he always shares tips I would have never thought of on my own! 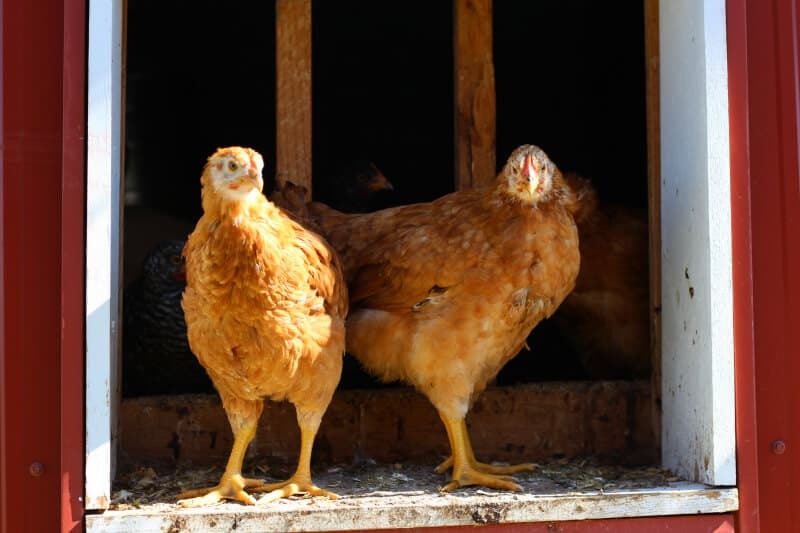 Four obvious (but overlooked) ways to reduce your need for chicken feed. Disgusting, but extremely resourceful, ways to turn dead animals into protein packed feed. Discover free foods right in front of your face (that most people call problems). Quick and easy adjustments to the grains you’re already feeding for 15% savings in 24 hours. 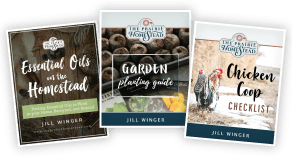 Save your spot in the Creative Chicken Feeds Webinar HERE– it’s free! 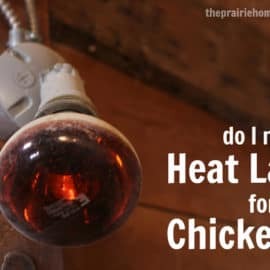 Supplemental Lighting in the Chicken Coop Do My Chickens Need a Heat Lamp? DIY Flock Block Substitute YOUTUBE + A Mad Mama Hen! Hi Jill! Absolutely love your blog! I have gleaned so much information and inspiration from you. I also live in Wyoming, north of you, around Torrington. I was wondering where you sourced your legumes, also the Nutri-Balancer? I went to this page and went through all the hoops of entering addresses etc only to find they charged almost $18 to ship a $23 product. Do you have any other sources or substitutes? Thank you! I live near Sheridan and there is an Azure Standard drop here. They sell the nutri-balancer. What I can’t seem to find is fishmeal.. I to am from wyoming. I love your blog. It gives hopefully homesteaders like myself hope that it is possible with the crazy wind..sudden weather changes.. poor soil! :). I would also love info on where you get your chicken feed! Thanks for blogging! Hello fellow Wyoming-ite! So glad you’ve been enjoying the blog. I get my other chicken feed recipe custom-mixed at the Z&W Feed Mill in Torrington, WY. Is the mix ground up or left whole? I called them yesterday and they don’t have any kind of peas. Is there a substitute you use? You can purchase the peas from any grocery store. They are split peas. If I wanted to purchase this in Torrington, what would I ask for? I was mixing my own but it’s so messy. I bought a mix in Fort Collins but it’s layermash and I’d like whole grain. I see lentils in the pictures but no other mention or ratio in the recipe? Thanks for clarifying! Sorry about that– there are no lentils in the recipe– this was just a photo I had taken a while back and wanted to use it. In the photos, it looks like you used red lentils instead of oats? We have ducks, and they eat the same things as the chickens. They only need extra niacin as ducklings, but other than that, they can eat chicken food. Justin has a YouTube channel up right now and he has 2 ducks in with all of his chickens. He feeds them the same thing as the chickens. He soaks the grains overnight. To get out and do the same! Great post today – Tool box #76 is tops! Thanks Kathy! And yes, Justin’s Vlogs are the best! I am having a hard time sourcing the fish meal. Any tips on where to find this? I live in California so I don’t think it should be this hard but I’ve actually been looking for a couple weeks already as we watch Justin’s vlog so I already had the recipe, but have had no luck finding it. I can get nutri balancer from azure standard (for a pretty penny…$97!!!) but can’t find the fish meal anywhere. I don’t feel like this can be skipped as its a vital protein source. This is part of the reason DIY chicken feed can be so complicated, unfortunately. I get fish meal through my local feed mill (I actually use a more complicated recipe that they custom-mix for me. Justin was just kind enough to let me include his formula here for folks who don’t want to make my more complicated version). baby chick starter and grower for broilers!! good basic recipes ??? I have ground grains before, for chick starter, balancing act gets very interesting, any suggestions??? Unfortunately for starter/grower, I always just use commercial feed. Anytime I’ve looked into it, it’s gotten too complicated trying to balance out the required ingredients. Thank you Jill for this post. I have been following you and Justun Rhodes for a bit now. I got my first pullets a few weeks ago. They are about 5-6 weeks old now. I have been feeding the commercial starter/grower crumble and they are doing great. I what age would it be best to switch them over to the feed recommended by you and Justin? Do they need to be transitioned to the change in feed or can they go from the starter to home made feed without issue? Thank you. I look forward to your reply. You now I am a lover of all your stuff…blog, facebook, I get excited about e-mail….I have a question..you mention the feed is $38 for 25 pounds…..I’m wondering how much a chicken eats in a day…..or how long does that 25 pound bag last for how many chickens? Hi Nancy, Unfortunately, I don’t think there’s an easy answer for that. It depends on their age, what else is in their diet, if they are free-ranging, the time of year, etc. dried soybeans good for chickens? No! Don’t feed chickens soy! It transfers to the eggs and to the people that way them. And many people can’t have soy! what if I’m the only one eating the eggs and I can have soy is it ok then? We are new to chickens and so far have only fed them regular store bought feed because I just couldn’t figure out any other option in my area. Thanks to you, I can now work on this combo and see if I can make it work – Thanks again! Hope it works great for you Karina! Thanks for this post! 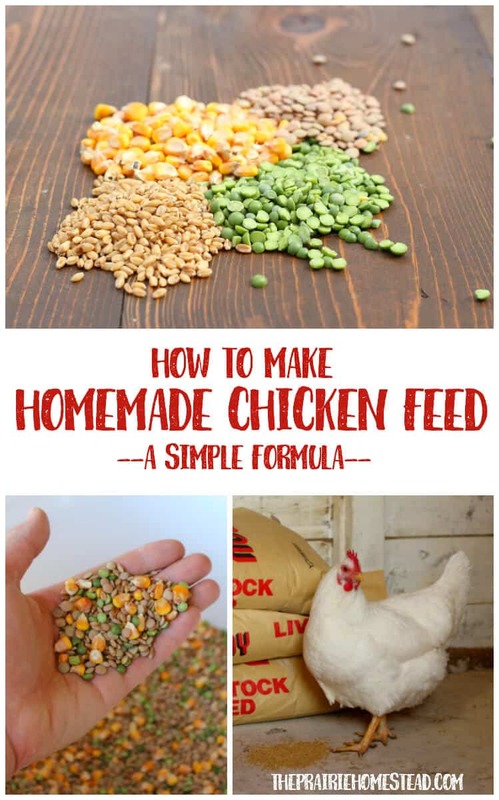 I’ve been wanting to start making our own chicken feed and didn’t know where to begin. I will definitely be mixing up a batch for our hens very soon! Hope it’s a big success for you Debbie! Loved this today! Can you share the link for Amazon, my searches keep giving me garden fertilizers instead of fish meal and kelp meal. Thanks so much for your blog! Since we just had our first batch of meat birds this year, I gave in and just bought meat bird feed this year. But hopefully I’ll have a DIY recipe in the future! Soybeans are not healthy for chickens or us at all. Black sunflower seeds and oats serve as a protein to. My 20 or more chickens are free range and I make a mix of 50 lb bags of corn, oats, rye, barley, and wheat that I get from our local feed store for $7.00 – $12.00 per bag. I add 25 -50 lbs. of black sunflower seeds to my mix. I give them 12-16 oz of my mix a day. My mix supplies me for 10 to 12 months. I also give them what ever I have left over from our meals. You can also give them peas or any other vegetables and fruit you want. I give them pumpkins in the fall which supply them with a lot of vitamins for their health during the winter. Hope this can help you. I’m in CA and my chickens love all things winter squash!! Carissa, how many chickens were you feeding have at the time you posted this? I use an even mix of organic oats, rye, wheat, barley, and BOSS which is fermented year round. The dinos also are on a rotational pasture system and get various food scraps along with farmed live mealworms. It costs me roughly $20/ month to feed them. I have been using fish meal for my chickens but I’ve been advised that it’s not good for your chickens. Because of high Mercury count is this true, can someone help me on this? Yes, fish products can contain mercury. It does depend on the fish meal, though. Most recipes only include it in small portions. Unfortunately, it’s hard (read: impossible) to find an absolutely “perfect” protein source, so sometimes you just do the best you can. I’m excited to try the chicken feed recipe! Even if it works out to be the same cost as commercial feed, it won’t have that ‘commercial feed’ smell to it! The birds already get roadkill deer when we can find it (and are driving a vehicle conducive to transport… and it’s still there on the way home ;). We’re blessed to have ample garden space, so excess will be planted for birds next year. I have a question about the recipe, though. Are the proportions by weight or by volume?? and it can be either weight or volume. Wowzers! $38??? We pay $13 for a 25 lb bag on non-GMO, antibiotic free formulated at our loan mill. I also give them fruits and veggies from the garden and sunflower seeds as added bonuses. I also toss those things with Oregano for the natural antibiotic properties. 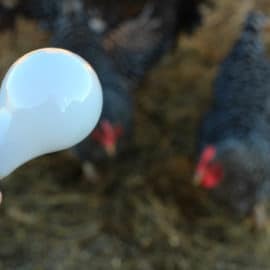 I’m fairly new to chickens, but I’ve found that a lot of research before hand and talking to those I know who love and raise chickens for the best advice. I haven’t paid anything for my babies themselves either. A friend of mine who raises them gave us one and fertilized eggs. We borrowed another friend’s incubator to hatch them. There is always a way. We also managed to get our paws on a lot of used wood and have paid very little for our coup. Thankfully, we live on 3 acres so we are able to free range. Hi Jill , I’ve read that you shouldn’t give chicken dried beans. Is it safe to add dried lentils and peas to the mix or could it hard them? Hey Jill, for your readers that don’t mind using regular feed I buy layer crumbles for $12 a hundred weight. I’d love to communicate with you about my little girl chicken, her name is Linda. I have a concern but almost never on pintrist. Is it possible to communicate with you by phone or email? It is important to have an analysis of the eggs to have the right balance of omega 3 & 6 the Hens might need more proteins. If there’s no right balance in the eggs this could cause some free-radicals /oxidation and can be dangerously for your health. It’s always good to get a commercial feed. I didn’t see any flax seed in the feed ? I must confess to being very confused about why it’s so complicated to balance a chicken feed. What were people feeding chickens before commercial feeds? I wasn’t under the impression they went to a lot of trouble about it. I agree, Rachel. And that’s a topic I’ve spent a lot of time thinking about. People have fed chickens for a long time before Purina came around… And the chickens survived and probably even thrived. Why does the recipe add up to 102%? I loved this blog post and all the posts I read of yours. I was looking at the the ingredients for the feed and was wondering what kind of oats are used. There are so many different kinds. When I was looking on Azure, they have feed grade corn and such. I would appreciate your help in this matter. Where is the recipe? I can’t see it. I agree with some of your readers. What did people do years ago before store bought feed. I’m sure the pioneers didn’t worry about the ratio of this to that. Also where (if they did) would they get it? Chickens have survived and produced for many years……before all this. Hi I was wondering what I could substitute for wheat? I have a friend with anaphylactic allergy to wheat. You lost me when you said corn. Corn should never make up 30% of ANYTHING for a chicken. It’s like feeding a person 30% of their diet in sugar or candy. We only give it in the winter for them to add extra fat to their bodies. If chickens get too fat they don’t lay eggs! I’m calling this. They’d do better eating “crap food” from the local store than that mix. Anyone who knows chickens should know this already. Please people don’t take her word for it!!! AGREE! Here in N. California we had Temps over 100° most of July. We have to stop ALL corn or they will overheat. Corn is a treat, not a staple. Absolutely…. totally agree ‘re the corn. Yes, the volume of corn in the recipe also concerned me! Hi there! Do you ?now if they make any plugins to help with SEO? not seeing very ?ood success. If you know of any please share. Folks thank you for all of the information, as I have read thru all of it. I can’t help but chuckle at listening to the prices of the ingredients and wonder “how is this saving any money”? Our local feed co-op sells an Organic Laying Mix for $8.50 for a 50 pound bag. Hard to beat!! Then you would have a bit of money in your pocket for fancy coops and treats. ? Hey Jill I was just wondering if those ratios are by weight or volume? Thanks and have a great day! Thanks too my father who told me regarding this web site, this webpage is truly awesome. Thank you for the simple recipe! I’ve been hunting around and found several more complicated mixes, but I think this will be a good place for me to start. We keep a dozen or so chicks for eggs, we’re vegetarians. We feed an organic feed for the girls. The fact is, in the old tyme days of gramma’s hens, they free ranged. Many were predated, many were eaten by gramma’s family. Very few lived past one or two years. Thay weren’t exposed to the toxic world we live in today. Most food was “organic” – LOL. It didn’t really matter what you fed them beyong corn or wheat. What is the protein % for this recipe? I’m wondering if I can feed it to both my broilers and my egg layers? Your blog is so helpful. We are building an extension to coop for feed as I want to mix my own and have started sprouting grains and fermenting. Loving having the chickens even though at sunset training them into coop is taking some time. Do you have to cook or soak anything in this recipe? Thanks! We are uncharacteristically snowed in here in Eugene, OR. There is a natural food store within walking distance that I can get bulk items at. Since this feed is expected to be quite short term, I am going to do some adjustments. Due to necessity, I am going to replace the vitamins with some marketed for people: multivitamin replacing the 2% vitamins and the Argonite being replaced with ground calcium carbonate vitamin). Additionally I will feed them some cheese and yogurt. If I cannot find bone meal, I have some beef collagen, mg++ and phosphorus to add to the food. Thank you for the recipe. Our little close to the coast, close to sea level valley town really shuts down when we get significant snow & this has been record breaking! so…what if you can’t use corn…what are your suggestions? See, I am very sensitive to corn…so the chicken can’t eat corn if I want to eat their eggs. Now I can eat the meat if they eat corn….Fun Fun. I do play on using mill worms…but want more for them..